SAN DIEGO, Oct. 11, 2017 /PRNewswire/ -- MyDx, Inc. (OTC: MYDX), a science and technology company and creator of MyDx® (My Diagnostic), the first multi-use handheld chemical analyzer designed for Cannabis professionals and retail consumers to correlate the chemical profile of cannabis with how it makes them feel and which ailments it alleviates, today announced the launch of its new website, www.mydxlife.com, a reimagining of its brand with greater clarification of its products and services. 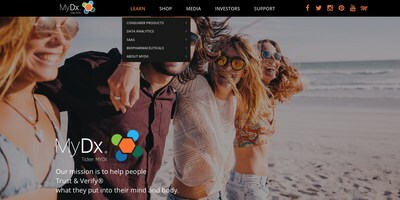 The structure of the new site aligns with MyDx's re-organized business segments and is set up for new customers to explore and purchase products from each of those new segments, seamlessly. "Our business model has transformed significantly over the past year with the introductions of the ECO Smart Pen, MyDx 360, and our data analytics platform, so we needed to update our website to account for those new products and services," said Daniel Yazbeck, CEO of MyDx. "When we started to update the website, it became clear to us we also needed to reinvigorate the look and feel of the website to represent our continued passion and drive for this company." MyDx, Inc. (OTC: MYDX) is a chemical detection and sensor technology company based in San Diego, California whose mission is to help people Trust & Verify® what they put into their mind and body by revealing the purity of everything they eat, drink and inhale. The Company's more immediate mission is to continue to develop smart devices as part of an ecosystem that crowdsources consumer generated preclinical data to drive innovation in the cannabis industry through its Consumer Products, Data Analytics, SaaS, and Biopharmaceuticals divisions. Its flagship product is the MyDx® analyzer, a patented, affordable portable analyzer that provides real-time chemical analysis and fits in the palm of the user's hand. The multi-use MyDx analyzer leverages over a decade of established chemical detection technology to measure chemicals of interest and is backed by a substantial and growing intellectual property portfolio of patents covering its technology. For more information, please visit www.mydxlife.com.